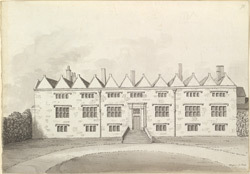 A view of the front entrance of the old manor house of Leigh Court, or Abbots Leigh House, in Somerset, "where Charles the 2nd hid himself and turned the spit after the Battle of Worcester". The National Gazetteer of Great Britain and Ireland reports, "it is situated in a wooded spot, near Rownham Ferry, on the banks of the Avon, and was the hiding-place of Charles II in 1651". It was rebuilt in 1814 by Thomas Hooper for Philip Miles, MP, in the fashionable Grecian style.